The move towards sustainability is now felt more than ever. Consumers have become more vocal in expressing their desire to protect the environment in ways they can. As a business owner, you can also choose to include your brand in the growing list of environment-friendly companies. 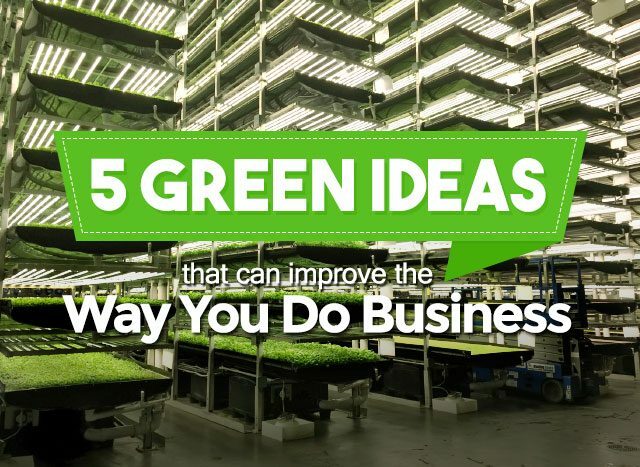 In this article, we highlight 5 innovative and green ideas that can change the way you do business. Making money and saving the planet should not be in conflict with each other. In fact, they go hand in hand to create a positive impact on your business, as well as the environment. The basics of 3 R’s has taught us how to reduce, reuse, and recycle. As the years passed, more inventive ideas emerged. Here are some of the eco-friendly business ideas to inspire the environmental advocate in you. Vertical farms, also known as indoor farms, have emerged in Eastern and Western countries. While at first sight, it may create the impression of improving the building’s aesthetics, this practice actually helps lower greenhouse gas emissions particularly those that come from traditional field agriculture which makes it one of the suitable solutions to problems related with climate change. The Food and Agriculture Organization of the United Nations has reported that agriculture, forestry, and other land uses contributed 21% of global greenhouse gas emissions as a result of the releases of carbon dioxide, methane, and nitrous oxide. Going paperless has been the advocacy of environmentalists. However, if your business relies a lot on papers and you cannot disregard its use at once, you still have a choice–ink cartridge refills. The act of reusing and refilling ink cartridges will not just spare you from higher printing costs. It is also a way to reduce non-biodegradable waste, therefore allowing you to contribute in lowering buildups in landfills. As a business owner, you’d want your workplace to look presentable and nice enough to keep your employees comfortable. But while the option of buying brand new is quite appealing, you’d find a better alternative in upcycling your furniture. Upcycling your furniture can spare you the higher cost of upgrading your workplace. You may be surprised to see how well an old furniture will transform after a good upholstery job. Should you want a total renovation and plans to get rid of the old pieces in your place of business, you can opt to sell your upcycled furniture. This option guarantees to get the results you want without contributing to the accumulation of wastes in landfills. You may not realize it but the right choice of office supplies also has a tremendous impact on the environment. And what better way to do that than to choose all-natural and organic products when buying supplies such as toiletries and cleaning products. As it turns out, organic products are not only intended to support health and wellness. You can also do your part in reducing environmental impact as these products increase the demand for sustainable farming which in turn affects the reduction in greenhouse gases emissions. Speaking of emissions, there are now more innovative transportation options that aim to protect the environment. You now have the choice to use solar-powered or electric vehicles for your fleet. When powered up completely, this type of vehicle can go up to 30mph. Of course, the option to use bikes remain. While this mode of transport facilitates environmental protection, it also paves the way for physical wellness. Green Courier, as the leading environment-friendly courier in the UK, supports the use of emission-free transport. The company has invested in a fleet of eco-friendly vehicles, including bicycles, motorcycles, goods vehicles, small and large vans, that are maintained in a state-of-the-art onsite technical facility. Entrepreneurs like you have a lot of options when it comes to environmental protection. By taking sustainable steps, you will be able to play a big role in making positive and long-lasting changes to preserve our planet.